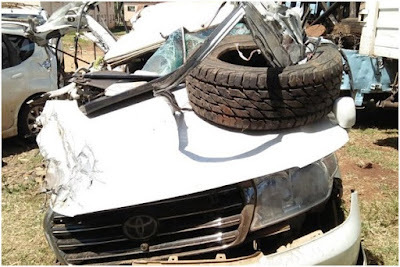 Friday, September 14, 2018 - Chief Justice David Maraga has mourned the sudden death of Environment and Lands Court senior Judge, Samuel Ndungu Mukunya, who was killed in a road crash at Embassy area on Nyeri-Nyahururu Road. The Judge died on the spot after the Landcruiser V8 he was driving lost control and hit a canter. “We learned this morning that he was a judge,"
“Judge Mukunya, a personal friend of many years, was an outstanding jurist. Heartfelt condolences to his family and friends,” Maraga posted on social media. The late Mukunya joined the Judiciary in 2015 during the last recruitment of judges. He had served many years as a High Court advocate. He was posted to the Bungoma Environment and Lands Court and had recently been moved to Kerugoya. See below what remained of the White Lancruiser V8 after the accident.